Gauging Community Interest Rustam Arstanov, an MBA student at the Mason School of Business at the College of William and Mary (C), discusses the idea of a community-supported fishery with an interested couple during the 2nd Sundays Williamsburg Arts and Music Festival on March 11th. Photo by David Malmquist. Local Interest Katie Moriarty, an MBA student at W&M's Mason School of Business, discusses a community-supported fishery (CSF) with a pair of festival-goers during the 2nd Sundays Williamsburg Arts and Music Festival on March 11th. The pair signed up for an online survey to gauge their attitudes and habits with respect to seafood consumption and a CSF. Photo by David Malmquist. Local Interest Rustam Arstanov (L), an MBA student in W&M's Mason School of Business, discusses a community-supported fishery (CSF) with Melody and Kaare Loftheim of Williamsburg during the 2nd Sundays Arts and Music Festival on March 11th. The Loftheims and more than 60 other residents signed up for an online survey to gauge their seafood consumption habits and attitudes towards a local CSF. Photo by David Malmquist. Blue Crabs The watermen that harvest these tasty crustaceans could benefit from a community-supported fishery. Photo by Janet Krenn/VASG. Local seafood once provided a major economic and cultural link between Chesapeake Bay and the people in its watershed. Today—with a few exceptions—the crabs, oysters, and fish on your plate are more likely to come from the Gulf Coast, Caribbean, or Far East. 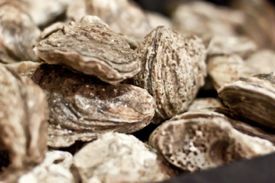 A new partnership between Virginia Sea Grant and the College of William and Mary—including the Virginia Institute of Marine Science, Mason School of Business, and Marshall-Wythe School of Law—is exploring whether a community-supported fishery is a feasible means to help reverse this trend by promoting greater consumption of locally harvested fish and shellfish. In addition to Hartley, the project team includes Michael Luchs, an Assistant Professor of Marketing in the Mason Business School; VIMS graduate student Gar Secrist, head of the VIMS “Green Team;” law students Nicole Benincasa and Michael Boyer; MBA students Rustam Arstanov and Tom Innes; and W&M undergraduates Matt Faust, Zander Pellegrino, and So Jung Youn. Funding to study the feasibility of a community-supported fishery in Hampton Roads comes from the College’s Committee on Sustainability. Established in 2008, the committee uses funds from the Student Green Fee to promote sustainable practices throughout W&M and nearby communities. The first part of the feasibility study—telephone and in-person interviews with W&M students, faculty, and staff—wrapped up in late February. The goal was to assess the respondents’ current seafood choices, knowledge of sustainability issues, local-seafood preferences, and willingness to pay for local fishery products. The next step in the project begins on March 12, when Luchs and his students build on the interview findings to launch an on-line survey (http://tinyurl.com/88pybhc) that will expand the study into the local community and provide more quantitative results. If the findings of the on-line survey confirm the positive comments from the interviews, the project team will move on to create a detailed business plan that identifies how to best proceed in terms of staffing, storage, transport, finance, legal arrangements, and other factors. Law student Nicole Benincasa is leading this study of the “organizational design” needed to run a successful CSF, with help from undergraduates Faust and Youn. The team will incorporate lessons learned from a small but growing number of community-supported fisheries at other campuses around the nation, including Duke University and the University of California, Santa Barbara. They will also work closely with LocalCatch.org, a national network of fishermen, organizers, and consumers committed to the growth of CSFs. Hartley stresses that market conditions and product supply are unique to every CSF location, but that all CSFs share what he calls “triple bottom-line business goals.” These include increasing the viability of local economies, cultivating healthy ties within and between rural and urban communities, and encouraging an ethic of environmental stewardship. To participate in the online survey, visit http://tinyurl.com/88pybhc.